As the School of Applied Sciences begins a new year, we welcome all new staff and faculty. In the office of Applied Sciences, we have a new network administrator, David Woo. We spoke with David about his new position, his past experience in IT, and how excited he is to be at Ole Miss. Tell us a little bit about your background in information technology. My previous employment was at a sizable law firm in Louisiana (350+ attorneys over 22 offices throughout the U.S.). In the past 10 years, my responsibilities included in the areas of networking, servers, messaging (email, mobile communication/management, telephony-VoIP, fax-FoIP), security, etc. David with his wife, Younghee, and their son, Nathan. Growing up, where did you call home? I was born and grew up in Seoul, Korea until I was 17 years old. Then my family moved to a suburb of Cleveland, Ohio, so I consider Columbus, Ohio as my hometown because that’s where I attended the Ohio State University for my undergraduate degree, met my wife, and started a family. How did you decide to come to University of Mississippi and Oxford? My wife, a former associate professor at the School of Social Work at Louisiana State University, has been offered a faculty position here at Ole Miss. So my wife has been instrumental in both of our two major relocations. First time, it was from Columbus, Ohio to Baton Rouge, Louisiana. This time from Baton Rouge, Louisiana to Mississippi. 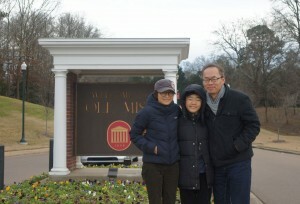 What was your first impression of the Ole Miss Campus? If I were to choose one word to describe this campus: Beautiful. My first visit happened to take place when the trees were beginning to change their dresses for the autumn weather. Being greeted by a collage of varying degrees of colors in addition to cool breeze was quite refreshing. I enjoy playing sports in general. Recently, I re-ignited my passion for playing tennis and hope to find a group/league here as well. Information technology is a broad field. What kind of work do you expect you’ll be doing for the School of Applied Sciences? IT is indeed a broad field and highly specialized these days, thus it’s quite early to share specifics at this time. However, as with my previously held position at the law firm, my overall emphasis for the SAS would be providing the best IT support to improve efficiency, to handle communication effectively, and to minimize interruption of IT services that our faculty/staff rely on.